Cook meat, onion, and pepper until done. Add 1 can whole kernel corn and 1 can tomato soup. 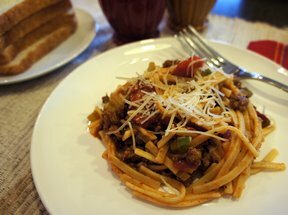 Let simmer and season to taste. Make white sauce of butter, flour, and milk. Add a few chunks of Velveeta cheese after white sauce starts to thicken. Cook 4 oz. medium wide noodles(more if desired). 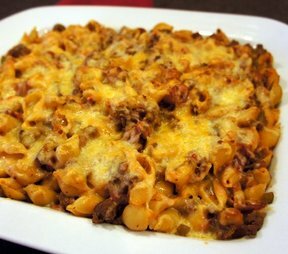 Alternate layers of meat mixture, noodles, and white sauce in a greased baking dish. 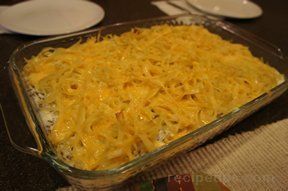 Sprinkle top with grated cheese.